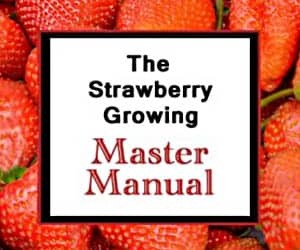 Pollinating strawberry plants is not all that complicated. However, if you want to have a heaping helping of delicious strawberries, it must be done. The good news is that your friendly neighborhood bugs and bees are usually pretty good at pollinating strawberry plants for you. If your strawberry plants are grown indoors or away from insect access areas, there are a few basics you should know. The male pollinating structure of a flower is called the “stamen.” Stamens usually consist of a filament and the pollen-containing anther. There are typically between twenty and thirty-five stamens of varying lengths in a strawberry flower. These stamens (collectively called the androecium) are arranged in a circle and are usually surrounded by five (or more) petals. Initially, the anthers are a yellow color while they hold the pollen, but they quickly pale after the pollen is released. The flower stem (pedicel) extends up into the flower and forms the cone-shaped area in the middle of the stamens. This stem extension is called the “receptacle” and will eventually turn into the strawberry after the pollinating strawberry plants has been completed. The receptacle is covered with the female part of the flower called “pistils.” Up to 500 pistils cover the receptacle in a spiral pattern. Each pistil has an ovary at its base, and an ovule is present within. When pollen from the anthers is transferred to the stigmas of the pistils, pollination is achieved. If pollen from the same flower accomplishes this feat, it is self-pollination. If pollination from anthers of a different flower occurs, it is cross-pollination. After pollen from an anther travels into the pistil and reaches the ovary, the ovule is fertilized and becomes a seed (achene). These are liberally dotted on the outside of the strawberries for all to see. 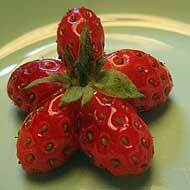 After this feat of nature, the tissue of the receptacle swells around the seeds to form the lovely strawberry. The actual pollination of strawberry plants can occur via self- or cross-pollination as mentioned previously. Self-pollination occurs when the anthers break open and release pollen that finds its way to the pistils. This transfer can occur through jostling by wind or animal or through rain falling or other mechanical forces. Self-pollination is, however, an inferior pollination method. First, it is rare that self-pollination results in complete fertilization of all the ovules. Second, fruit set is typically better for cross-pollinated flowers even if the anthers surrounding the receptacle on the same flower are heavy-laden with copious amounts of pollen. Remember, pollinating strawberry plants is what triggers strawberry development. The receptacle tissue swells around the seeds each time a seed is pollinated. So, if only half the seeds on a strawberry are pollinated, you can reasonably assume that the strawberry will be about half-sized. Additionally, if a strawberry gets pollinated sparsely, or a cold snap drives the local insects into hiding, the resultant accessory tissue around the achenes (seeds) can develop incompletely. A bee shortage in your area will also contribute to small or malformed strawberries. 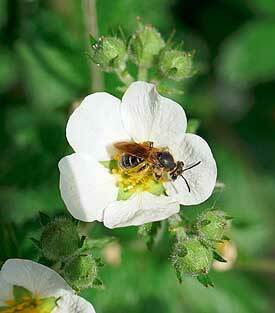 Honey bees and other wild bees are the best pollinators of strawberry flowers by a wide margin. While other insects contribute, bees are the predominant pollinators. If bees are scarce in your area, your strawberry harvest will likely suffer.